Comprehensive review of Cocoa Brown 1 Hour Tan Mousse. See what real experts and actual users have to say about this self tanning product. This 1 hour Tan Mousse really fell flat for me, so I gave it 1.75 out of 5 stars. I was so excited to try this product because I had a good experience with Cocoa Brown’s gradual tanner. But this experience was the complete opposite. Let me start off by saying, this product does smell really good. Until the product develops, and then it smells like DHA. The application process is a pain. It takes SO long and you really have to put some muscle into it as the product dried pretty quickly, making it hard to blend in. I left it on for 3 hours, and then rinsed it off. It took another 8 hours to see any tan at all, and the tan I got was a very light color. It was more of a “glow”, than a real tan. After the hassle of applying it, I wanted a dark tan gosh darn it! So overall, I was disappointed in Cocoa Brown 1 Hour Tan Mousse. This one hour tan comes out looking like shaving cream. I’ve never seen a self tanner with this texture before, but it’s technically a mousse. It has a light brown color to it that darkens as you apply to the skin. Applying this mousse is a nightmare. I thought it’d be relatively easy, but boy was I wrong! The product dries relatively quickly, so you have to work really fast to blend the product in. And the product is very difficult to blend in. I was scrubbing so hard my mitt came off my hand a few times. The guide is just really hard to blend in, and I kept having to go over the same areas multiple times. If you’re looking for a quick application, this is definitely not the right product for you. When it was all said in done, application took me over 40 minutes which is ridiculous. Drying time was pretty fast, it dried a lot once it touched my skin. However, it took about 15 minutes to completely dry. After it dried I felt a little sticky when my body parts would touch each other for the next 3 hours. 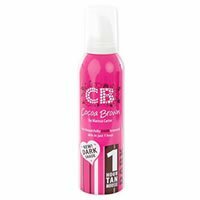 Cocoa Brown 1 Hour Tan Mousse smells really good! It smells very sweet and fruity. It reminded me of how some Victoria Secret products smell. I couldn’t smell any DHA while applying it. As it developed the sweet smell faded, and when the 3 hours were up I smelled like DHA. The directions say to leave the tan on 1 hour for a light tan, 2 hours for a medium tan, and 3 hours for a dark tan. I left the product on for 3 hours before washing it off. Immediately after I washed the product off, I saw no color difference in my skin at all. I still looked pasty white. The bottle says the tan continues to develop after rinsing it off, so I waited for my tan to develop. It took another 8 hours to see any color difference at all! The tan I had after 8 hours was very light, more of an all over glow. I definitely wasn’t “dark”. For the amount of time it took to apply the product, and then sitting around for 3 hours with it on, the color just didn’t pay off. Also, it confuses me that they call it a “1 Hour Tan”, as it takes over 11 hours total to see any tan. I was really disappointed with my light tan; I don’t know how they can call it dark. My light tan lasted around 2 days before it started to fade. The good news is it didn’t fade unnaturally. No. I don’t think they’ll like the results of this 1 hour tan. Cocoa Brown 1 Hour Tan Mousse is $14.47 per bottle, which is very reasonable. But I still don’t think it’s worth it! To buy Cocoa Brown 1 Hour Tan Mousse, Click Here. Look and Feel This is a foamy mousse; it looks like a tan colored shaving cream. Application Applying takes forever and is a lot of work. Drying Time It dried in under 15 minutes, which is good. Smell (Before) Smells so good, very sweet and fruity. Smell (After) After 3 hours I smelled like DHA. Color Produced I had a light tan, that was more of a “glow”. How Long It Lasts It lasted 2 days before fading. OK For Men? No, I think it’s a lot of work for a light tan. Price It’s very cheap, at $2.95 per ounce.